Synthetic peptide, corresponding to a sequence from the C terminus of Human Carbonic Anhydrase II. Human fetal brain, Caco 2, 293T, and Human heart lysates; Human kidney and brain tissues. Our Abpromise guarantee covers the use of ab124687 in the following tested applications. WB 1/1000 - 1/10000. Detects a band of approximately 29 kDa (predicted molecular weight: 29 kDa). ab124687, at 1/250 dilution, staining Carbonic Anhydrase II in paraffin-embedded Human kidney tissue by Immunohistochemistry. Lanes 1 - 4: Merged signal (red and green). Green - ab124687 observed at 32 kDa. Red - loading control, ab8245, observed at 37 kDa. ab124687 was shown to specifically react with Carbonic Anhydrase II when Carbonic Anhydrase II knockout samples were used. Wild-type and Carbonic Anhydrase II knockout samples were subjected to SDS-PAGE. Ab124687 and ab8245 (loading control to GAPDH) were diluted at 1/1000 and 1:10,000 dilution respectively and incubated overnight at 4C. Blots were developed with IRDye® 800CW Goat anti-Rabbit IgG (H + L) and IRDye® 680 Goat anti-Mouse IgG (H + L) secondary antibodies at 1:10,000 dilution for 1 hour at room temperature before imaging. ab124687, at 1/250 dilution, staining Carbonic Anhydrase II in paraffin-embedded Human brain tissue by Immunohistochemistry. Publishing research using ab124687? Please let us know so that we can cite the reference in this datasheet. I'm looking into a panel of antibodies from your company to use in cells of pig origin. ab758 ab27988 ab7504 ab124687 ab28028 ab11333 ab32362 I would like to know the following: Have they been tested in pig cells? If yes, are they reactive towards pig cells? If you do not have that information, can you tell me the epitope or peptide sequence that was used in generating that antibody? If you do not want to tell me that info, can you tell me the identity percentage of match of the pig compared to the epitope that it was used in generating the antibody. Many thanks! I heard back from the lab about the last two antibodies. For ab32362, the immunogen sequence shares 100% homology with pig. For ab124687, the immunogen peptide maps between amino acids 235 - 260, on the C-terminus of human CA2 (UniProt: P00918). I hope this information helps. Please contact us with any other question. For ab758, the immunogen that was used was cytoskeletal extract of human hepatocellular carcinoma cell line, Hep3B. 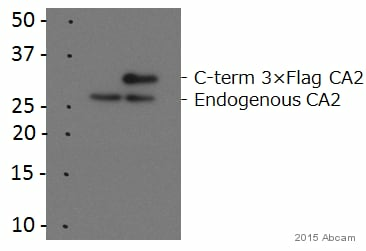 We have not validated this antibody in pig. But the human sequence is 85% homologous with the pig cytokeratin 8 sequence. We generally say anything with >85% homology would be expected to cross-react, so this is right on the edge. However, we do have two anti-cytokeratin 8 antibodies that we know do work in pig as ab2531 and ab2530. For ab27988, this antibody has been validated in pig and we therefore guarantee it will work for pig in IHC-P, IHC-Fr in accordance with our Abpromise. For ab7504, the immunogen was human breast carcinoma cell line, MCF-7. Pig and human EpCAM is 83% homologous, so this is a little low. We have an anti-EpCAM that is predicted (>90% homology) to cross-react with pig, and that is ab71916. However, this hasn't been validated and therefore not guaranteed in pig. I have to check with the lab on ab32362 and ab124687 since I don't have the immunogens readily available to BLAST. For ab28028, full length native protein (purified): Vimentin isolated from bovine eye lens was used as an immunogen. Pig vimentin and bovine vimentin are 97% homologous, so there is a good chance this will cross-react with pig. However this hasn't been tested and therefore isn't validated in pig. We do have a few vimentin antibodies that work in pig though,like ab20346 and ab8069. For ab11333, cultured human thymic fibroblasts was used as an immunogen. We don't have a particular protein sequence to look up for this one, so unfortunately we don't know how/if it will work with pig. I hope this information helps. I'll be in touch again once I hear about ab32362 and ab124687.